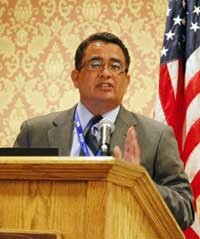 El Paso, Texas, District Attorney Jaime Esparza spoke in Sun Valley on Wednesday. He described the stark contrast between the peaceful city of El Paso and the violence of Ciudad Juarez, only a few miles away in Mexico. The potential for violence from Mexican drug traffickers spilling over into the U.S. was a topic of discussion on Wednesday at the National District Attorneys Association summer conference in Sun Valley. One of the most dangerous gangs working with Mexican drug cartels north and south of the U.S. border, Barrio Azteca, is now present in Idaho, said a district attorney from El Paso, Texas. About 150 state and federal prosecuting attorneys from around the country met to discuss legal affairs, prosecution strategies and ethical and media issues relating to their profession. The attorneys focused on strategies for working together, and with Mexican authorities, to stem the tide of drug-related violence that has claimed about 40,000 lives in Mexico since 2006, the year Mexican President Felipe Calderon decided to wage a war against Mexican drug cartels. Those strategies include the extradition of alleged drug traffickers from Mexico to the U.S. to stand trial, the training of legal and law enforcement authorities south of the U.S. border, and the sharing of information between law enforcement agencies. U.S. Assistant Attorney General Lanny Breuer said extradition is "critically important," especially with "high-value targets" in the drug cartels. Breuer said eight to nine attorneys at the U.S. Department of Justice work full-time on mutual legal assistance and extradition efforts with Mexican officials. El Paso District Attorney Jaime Esparza said 65,000 legal U.S. border crossings occur each day from Ciudad Juarez to El Paso alone, making policing of the 520-mile Texas border problematic. "We have to balance commerce with law enforcement," he said. El Paso is across the border from Cuidad Juarez, which Esparza called "one of the most dangerous cities in the world." He showed graphic images of beheadings, mutilations and devastation from improvised explosive devices, all of which occurred south of the U.S. border. Last year, Esparza said, there were 3,111 narcotics-related murders in Ciudad Juarez, compared with 11 homicides of any kind in El Paso. He said drugs flow north to the U.S. at El Paso, while weapons and money are smuggled south to the cartels. "They have unlimited resources," he said, referring to the estimated $15 billion in annual revenue from Mexican drug sales in the U.S.
Esparza said the U.S. was successful at keeping the drug-related violence south of the U.S. border due to interdiction efforts, communication between law enforcement agencies and the successful prosecution of drug traffickers. "The reason we are safe here is because there are consequences to what you do in the United States," he said. But Esparza warned that the drug cartels, and the gangs on both sides of the border that carry out their orders, are recruiting young U.S. citizens to work for them because juvenile offenders are likely to be released from detention after being arrested. "They know that the federal government does not deal well with juveniles," he said. Esparza said Barrio Azteca, an especially ruthless gang formed originally in the El Paso prison system, has been hired as a paramilitary force for one of the largest drug cartels in Mexico. "They are mean and vicious," he said. Ron Brooks, president of the National Narcotics Officers' Associations' Coalition, said Barrio Azteca was active in several states in the U.S., including Idaho. "Barrio Azteca has an infrastructure and they have a constitution," he said. Arizona Assistant Attorney General Richard Wintory said the "real heroes" in the drug war are the Sun Valley conference's counterparts in Mexico, who face threats from drug cartels and gangs. He said a good example is Mexico's attorney general, Marisela Morales, whom he recently met. "She is single and lives at an army base. She can't go anywhere," Wintory said. "The conference we're having now could never happen in Mexico without so much security that the National District Attorneys Association could not afford it," he said. Wintory stressed the importance of anonymous "tip lines" to police and regularly posted suspicious-activity reports from banks as means of fighting the organized drug trade in the U.S.